So I’ve made it to my senior year, and I thought I’d share what I’ve learned throughout the years. I managed to maintain a 4.0 GPA, and I’m going to tell you exactly how I did it. 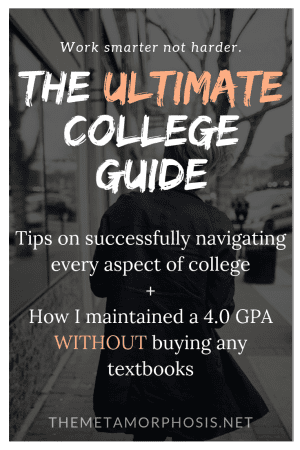 I’ll also share all the other tips I have for successfully navigating college including, how to study, save, and pay for school. I’ll also let tell you how I managed to get this far without ever purchasing a textbook. So let’s get started, shall we? FTC Disclaimer: This post contains affiliate links, read more here. So I’m assuming you don’t have an extra $20k or more lying around to casually pay for school. Well, guess what? That’s something we have in common. You may also even be one of those people that FAFSA awarded a whopping $0.25 in financial aid for the school year. I can also relate. So let’s talk about different ways you can pay for school. Now, there are lots of scholarships out there for almost every category you can think of. However, the competition for those national scholarships is very high. In fact, if you’re like me and you’ve applied to probably 100 of these scholarships, you’ll know that some don’t even email you back to let you know you didn’t win. You just figure it out over time when you don’t hear back from them. I don’t say this to discourage you but rather, so you realize that you need to narrow your search to improve your chances. I would recommend focusing on foundational scholarships like the Gates Millennium Scholarship or The Coca-Cola Scholars Foundation. You also have a better chance of applying to your university’s scholarships than these generic national scholarships. I would also encourage you to apply for scholarships from different programs or organizations that you’re a part of. For example, certain academic student organizations on campus may have scholarship opportunities; apply for them. You have a better chance of winning because there are fewer people who meet the requirements. I would strongly recommend going to your school’s financial aid office or scholarship resource center when you need funds. In my junior year, I found out about all these financial aid resources my school provided that I had no idea of. For one, there was a retention grant that was given to seniors (first priority, but not limited to) to help pay off their balance. That same grant is also awarded to randomly select students in good standing with relatively low balances. 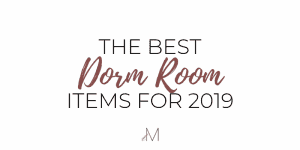 These are things that aren’t on the homepage of your university’s website, but they are available – you just have to ask. I always worked to pay for school. I’d make enough money over the summer to pay for the fall semester but spring semester was another story. Since I had to work and go to school full time during fall, I didn’t always have enough to pay off the balance immediately. For this reason, I’d suggest using a payment plan. My school offered a payment plan that required a 50% deposit upfront, and then two separate payments of the balance over three months. This gave me time to slave at work to get the rest. If your school offers this plan, I’d suggest using it if you’re low on cash. If you’re not sure, visit your financial aid office for more information. The least favorable option would be student loans. I won’t encourage this too much because I imagine the sound of debt doesn’t interest you. However, for some that may be the only option. In that case, I’d recommend playing it safe with the government loans offered by FAFSA first before seeking private loans which may have a higher interest rate. Now that your funds are in order let’s discuss your class schedule. But first.. I would highly recommend using RateMyProfessors.com when choosing your classes. I’ve used it every year since my freshman year, and it has been a lifesaver. RateMyProfessors.com allows you to look up the professors at your university for almost every class (as long as past students have reviewed that professor – if not you can add them). You can see their overall score based on their ratings as well as comments and tags students have left regarding their class or teaching style (see photo below). Scroll through your school’s portal where all the classes are listed and find the options for your first class. Eg. If ACCT 2101 is your first class. Look through all the different sections offered for this CRN (course registration number). Open RateMyProfessors.com in a new tab and look up all the professors listed. Read the reviews and pick which professor (and class time) is best for you in your school’s portal. Now that you’ve chosen your classes let’s talk about textbooks. Yes, you read that right. I’ve never purchased a textbook in college, and I have a 4.0 GPA. Disclaimer on not using textbooks: for me personally, I’ve avoided buying textbooks because I knew I wouldn’t read them. Most professors test you on the notes they provide, so you don’t need the textbook unless you want to have that extra understanding or materials the textbook provides. Also, I was a broke college student who had to use my own money to buy textbooks, so I would wait to see if I actually needed them (ignoring that email your professor sends beforehand saying you absolutely need it – most of them are required to say that). After waiting a few weeks in I realized I didn’t actually need my textbooks so I never bought them, and still got A’s. Don’t BUY textbooks, RENT them. When you buy a textbook, you’re practically throwing away money. Why? Because no one is going to buy it from you for the full price you paid – not another student, and definitely not the bookstore. Unless you need for a whole sequence of classes over the years (e.g. ACCT 4111, ACCT 4112 and ACCT 4113), I would not recommend buying textbooks. So here’s how you can rent them for cheap. Slug Books allows you to look up the textbook you need and compare the price of buying versus renting it. 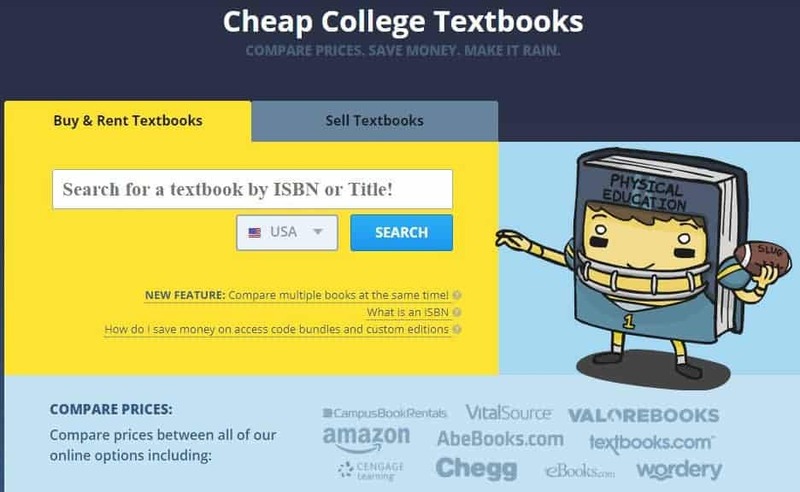 It pulls prices from all the popular sites you buy your textbooks from. This includes Chegg, Amazon, Barnes and Noble, etc. Type in the name/ ISBN of the textbook you want in the textbook (pictured above). I used my accounting textbook for this example. You can see the original price it would cost to buy the textbook (which is why I don’t recommend buying it), and you can see the prices you can rent it for on the various sites. In my case, I’ve only rented two textbooks in my sophomore year. One I actually used but the other I never even opened. Luckily for me, I only paid $17 to rent it, and I had free shipping on the return. I was still upset though because that money could’ve been spent on food. In case you were wondering, I’ve used Chegg and Amazon Rental to get those two textbooks, and they were both great. Amazon ships it to you faster, but it’s not always cheaper. You get free returns with both. P.S. As a college student you get a free 6 month Amazon Prime trial! Now that you chose your classes and have your textbooks (or not), let’s talk about how you can pass your classes. So how exactly do I maintain my 4.0 GPA? Simple – by working smarter, not harder. I’ll admit that I have somewhat of a photographic memory so if I write something over and over or read it over and over then sometimes I’ll remember the material that way. However, I don’t typically rely on this. If your professor provides a study guide, use it. Some people will try to read all the chapters in their textbook or read all their notes for a particular exam. Do not do this. Open the Word document (if you prefer to do things electronically, like me) or get a piece of paper. Write down all the necessary notes that pertain to each bullet point on your study guide. Make the question bold to differentiate it from the answer and list the answers in bullet points. If it’s a conceptual question, write the notes. If it’s a math formula or a diagram type of question where it requires critical thinking, do the same but take note of it on a separate piece of paper (or in Notepad if online) so you can practice it later. Above is an example of the first two objectives for an exam in one of my old accounting classes (that’s my major, btw). The objective for the exam is bolded, and my notes are listed below. Now that you’ve completed your study guide (which is also a form of studying), go over the notes and practice the critical thinking questions. Luckily for me, most of my professors test on exactly what is on the study guide… so that’s exactly what I study. I try not to do too much like read up on extra notes because there is such a thing called information overload. The trick is to study effectively, not excessively. I don’t know about you, but for me personally, too much reading can put me to sleep. From experience I know that I don’t retain much information that way; I learn more by doing. It’s important for you to understand how you learn so that you can do more of what’s working to improve your grades. For my accounting classes, and for any math-based classes, I would recommend using practice problems in your textbook or notes. You can also use websites like Chegg or Course Hero to find materials for your class or similar classes at other universities. If you’re in college and you’re not using/have never heard of Quizlet, consider climbing out from under that rock. No really, Quizlet should be your best friend. I’ll admit that I used it more in my freshman and sophomore years because there was more material for the classes I was taking at that time. 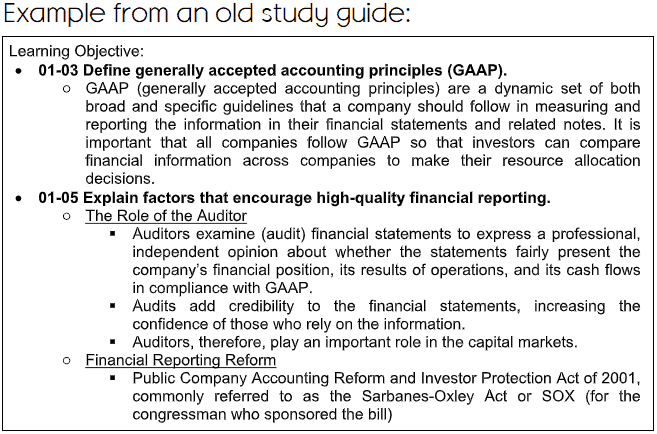 However, ever since I started taking my accounting classes, it’s been better for me to just use the study guides provided. 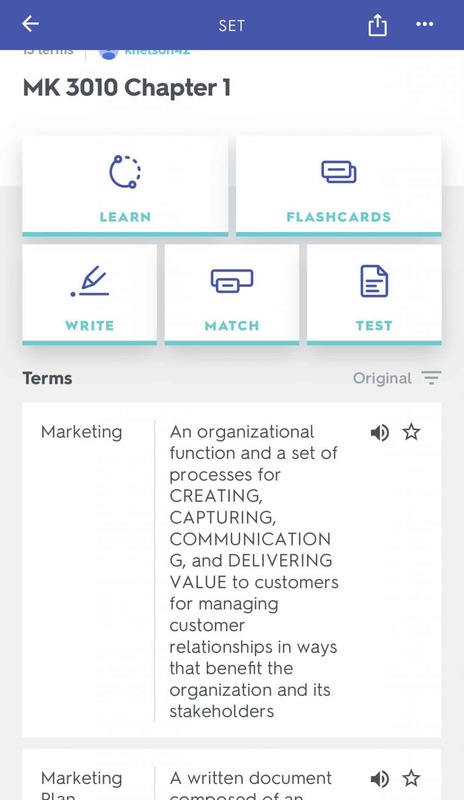 Quizlet allows you to create flashcards for your classes and test yourself on the material by playing matching games or creating practice tests. You can also type in your course registration number (ACCT 4111 for example) or the name of your class (Intermediate Accounting) to use other people’s flashcards for the class, or similar classes. It may not always match up with the class exactly because the material varies amongst universities, but the right keywords can definitely land you some useful material. Okay Sensi, so how exactly do you have a 4.0? Choose electives with A+: if you want to boost your GPA what you really need is A+’s. I take electives that cap at an A+ rather than just an A so I can get more quality points added to my GPA. First, you select it, then you work for it. (Note: you can either email the professor and ask for the syllabus ahead of time or register for the class and drop it during that first week if it doesn’t cap at an A+). Get feedback: If I have papers to write, I explain every point in depth, and I start by using an outline to guide my thoughts. I also go to office hours to get feedback on my work. I’m not gonna lie, I’ve only been to office hours for one class because I genuinely didn’t know where to start with my paper. However, I’ve usually always emailed professors when I needed help or feedback on my work. Extra credit: I also do all the extra credit in my classes if it’s offered – even if I already have an A. I don’t want to say that this leaves room for failure, but it does. Should I get a lower grade on an assignment, the extra credit will make up for it. Study a lot: this is a no-brainer. I spend hours studying for class until I know enough to be able to explain the concept to someone else. But remember, study what will be on the test, not all the material provided in the text. P.S. I Go over my exact study routine and habits that help me maintain my 4.0 GPA in this post! Check out my posts on saving money and getting cash back and my Ebates guide when you shop for a more in-depth explanation of this concept. I talk about all the methods I use to save when I shop + tips to save when you travel. Now if you’re anything like me, you’re probably thinking “Girl, I’m not volunteering for people to do tests on me.” I thought the same thing at first until I realize that they’re not actually running tests on me – just testing the way I respond to questions. Well… at least the experiments I do go to. I sign up for paid experiments at the school of policy studies. The experiments are usually conducted in groups but completed individually and anonymously. We answer a series of questions on a computer so researchers can study our decisions based on certain incentives. I usually make about $20 per experiment. Reach out to people in the policy studies, psychology and science departments at your school to inquire about paid studies/experiments. They’re usually not advertised. I found out from a friend. You definitely want to get involved on campus. It shows that you’re well rounded, and you also get to meet new people and make friends. Now, don’t be an overachiever like me and try to join four different organizations at once. Heads up – you don’t have the time. You may think you do, but you don’t. Go to the student organization fair (if your university has one) or look them up online. Make a list of the top 5 organizations that interest you and join one or two. If you’re a freshman/sophomore, I’d say join organizations that are more social than professional. That way it’s more fun for you, and you get to make new friends during your transition. Join professional organizations in your junior/senior (maybe even sophomore) that is tailored to your major. That way you get professional experience and get to network with people in your industry. There are lots of other ways to get involved other than student organizations. This includes joining the newspaper, programs and university events board, student government, homecoming king/queen, etc. The choice is up to you. Gone are the days when you have to go to the grocery store to get groceries. Now, you can order it on your phone and have it delivered to your door – or outside your dorm. Don’t get me wrong; I still go to the store every now and then when I get to carpool with my friends or use the university shuttle. This is especially needed for buying certain items like meat. Soooo most of you guys may not have heard of these two rideshare apps. They’re called Uber and Lyft, and they’re literal lifesavers. Okay but seriously, if you don’t have an account feel free to sign up using my links for up to $5 off your first ride at both Uber and Lyft. Sidenote: don’t you miss when it was $20 off your first ride? I sure do. I haven’t used the Birds or Limes yet because I had a bad experience with a scooter as a child. I’m sure these are much easier to use but oh well. I thought about trying one, but I definitely won’t be using it until it gets warm again. The thought of cold wind hitting my chest is not very appealing. Don’t forget your free checklist!